Yep, that’s a shameless bid to appear higher on Google search results, but it’s also a pretty good metaphor for what’s happening in Washington in advance of the Supreme Court oral arguments on the Affordable Care Act–due to be heard March 26, 27 and 28. Although speculation about how the Justices may rule has been going on for months, the gambling has reached a fever pitch. Next week is to Court Watchers as the Final Four is to legions of NCAA Division 1 basketball fans: The brackets have been completed; it’s just a question now of who will come out on top. Conventional wisdom has the Supreme Court splitting along perceived “party lines” in a 5-4 vote either in favor of upholding the law, or against it. But with the Justices taking on three separate, major issues within the law, Washington wonks, soothsayers, and legal eagles have gone into a frenzy of handicapping. Not a day goes by without a backgrounder or briefing that professes to have the best read on the tea leaves. The Court, as is its wont, has shied from the limelight. Until today, it had not even determined how it would accommodate the legions of journalists (myself included) who will descend upon the courtroom to cover the historic arguments. Details are still being worked out, but one thing was not going to change: the Court has steadfastly refused to allow audio or video broadcasts of the proceedings. (Which means there cannot be any contests requiring a shot every time the challengers’ attorney, Paul Clement, utters “individual mandate.”) The Court is even banning–heaven forbid–cellphones. That means no pithy Tweets on Justice Clarence Thomas’ enduring silence. 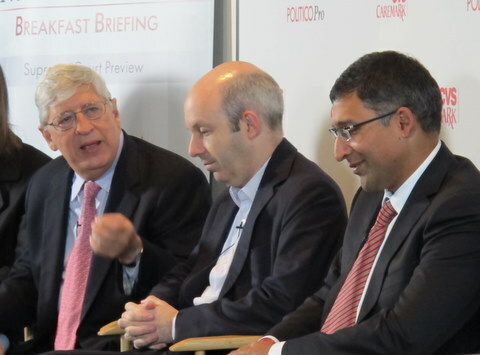 This morning–at a briefing sponsored by Politico–came new predictions from an estimable panel of D.C. insiders: former U.S. Solicitor General Walter Dellinger, Neal Katyal, Al Gore’s co-counsel at the Court in Bush v. Gore, Tom Goldstein, a former Court clerk and publisher of Scotusblog, Kevin Walsh, a former clerk to Justice Antonin Scalia, and Nina Totenberg, the veteran Court correspondent for NPR. Will politics come into play? Justices “have a grasp of politics that defies imagination in terms of its inaccuracy,” said Ms. Totenberg, who, like the others discounted the idea that the Justices would be influenced–or motivated–to vote in one direction or another based on the prevailing political winds. The panel was unanimous–except for Ms. Totenberg, who recused herself from making a wager–in its opinion that the Court would uphold the law, most likely in its entirety. Mr. Goldstein said he could not effectively imagine a victory by the law’s challengers. If the Justices threw out the Act, it “would lead to probably an array of attacks on different parts of the federal regulatory state because for the first time you would have had five justices that take very seriously limits on congressional power,” he said. By the end of next week, the Court will likely hold one closed-door conference and a series of votes, said Mr. Walsh. He and the other panelists went out on a limb, saying that the 5-4 prediction may no longer hold. Mr. Goldstein said it could even be a 6-3 or 7-2 ruling upholding the law. So who will write the opinion, expected to be issued in June? Mr. Dellinger predicted that it would be Justice Roberts. Mr. Goldstein, however, said this might be the rare case where the Court issues a per curiam opinion—that is, written in the name of the Court, rather than by any of the Justices. Interestingly, Bush v. Gore was a per curiam decision. Poll: Most Want the Mandate Nixed. Do You? As the Supreme Court prepares to take on challenges to the Affordable Care Act, new data suggests that Americans remain divided on the constitutionality of the law’s requirement that all Americans purchase health insurance. 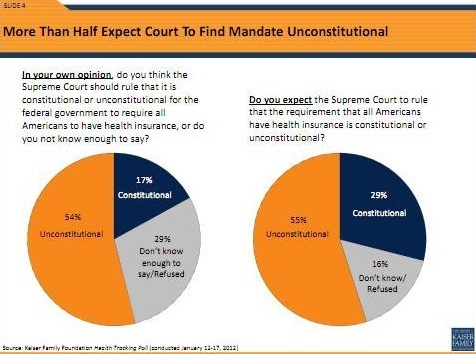 Little more than half of Americans (54%) think the individual mandate should be ruled unconstitutional and that the Supreme Court will likely agree (55%), according to a recent poll by the Kaiser Family Foundation. The poll was based on telephone interviews with 1,206 adults in the United States from. Jan 12-17. The poll also found that more than half (59%) of Americans think the Supreme Court Justices will base their ruling on their own opinions. That sentiment is being echoed by the conservative interest group Freedom Watch, which recently filed its second petition to request Justice Elena Kagan to recuse herself. 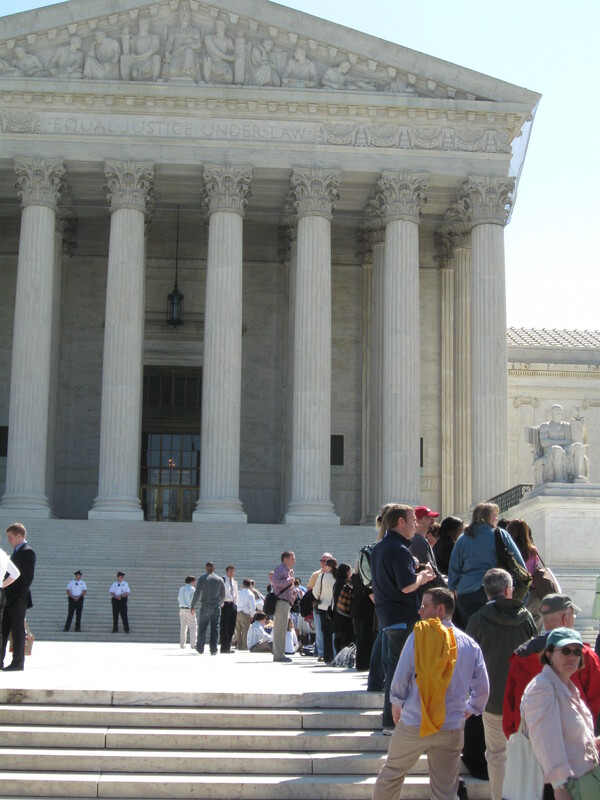 Supporters of the petition take issue with Justice Kagan’s former position as Solicitor General and close adviser to President Obama while the law was being written. If the mandate were ruled unconstitutional, it’s not clear if the rest of the law would remain solvent. According to the poll, 55% of American thought remaining provisions of the law would survive but 30% said it would mean the end of the law entirely. Further, the Kaiser poll shows that Americans are split on their own opinions of the ACA. According to the poll, 44% are against the law, 37% support the law, and 19% are unsure. 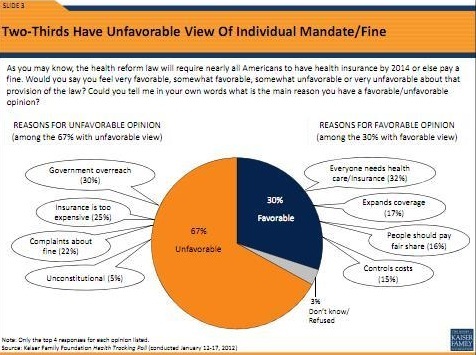 However, a majority (67%) oppose the mandate because it forced American to do something they don’t want to do (30%) or because health insurance is unaffordable (25%). An additional 22% just don’t like the idea of paying a fine for not having insurance. Those who do support the mandate (30%) said it guarantees that everyone needs health coverage (32%) and that the mandate can guarantee that (17%). Some also said the mandate could control costs (15%). Do you agree with these findings? Tell us more. The Obama administration really, really wants doctors to start using electronic health records (EHRs). For the past few years, they have been out urging physicians to invest in the systems and offering a pretty big carrot for adoption. Under the 2009 HITECH (Health Information Technology for Economic and Clinical Health) Act, physicians who meet certain quality metrics through the use of certified health IT systems can qualify for incentive payments from Medicare and Medicaid. Under the Medicare program, the maximum incentive is $44,000 over 5 years. Under Medicaid, it’s nearly 64,000 over 6. HHS officials want to make paper medical records a thing of the past. Courtesy Wikimedia Commons/U.S. Navy Photo by Rod Duren/ Public Domain. Now officials at the Health and Human Services department are trying to drive up adoption by removing a potential barrier to early participation in the program. HHS recently announced that physicians can begin participating in the incentive program this year and not have to meet quality standards until 2014. Previously, if a provider reported to HHS that he or she was using health IT as part of the incentive program in 2011, they would have to meet the quality standards starting in 2013. But those that started sometime in 2012 wouldn’t have to meet the standards until 2014 and would still qualify for the maximum incentive payments. It can get a little complicated, but essentially HHS is trying to take away reasons for people to hold off on adopting EHRs. It’s hard to tell if this latest policy change will make a big difference to physicians considering an EHR. But the incentive program as a whole does seem to have physicians interested. A new survey from the Centers for Disease Control and Prevention found that 52% of office-based physicians report that they plan to take advantage of the new incentive payments. As for doctors who have already adopted some type of “basic” EHR, that number has climbed from 17% in 2008 to 34% this year. Reaction has been mixed to the Occupational Safety and Health Administration’s recent decision to deny a second petition from the Public Citizen Health Research Group and other groups to have OSHA, rather than the Accreditation Council for Graduate Medical Education, regulate resident/fellow work hours. The American Medical Association, which had worked to keep ACGME at the helm, applauded OSHA’s decision in a recent statement . OSHA officials also noted that federal whistleblowers provisions protect residents and interns who voice concerns related to extended work hours. Currently, when a resident reports work-hour violations, they risk retaliation from colleagues and put their training programs at risk for probation and even loss of accreditation, Sonia Lazreg, health justice fellow with the American Medical Student Association, said in an interview. After the 2003 work rules were implemented, more than 80% of residents reported that their programs were in violation when they could report anonymously to an external body, she said. During the same period, ACGME resident survey reporting suggested that only 3% of programs were in violation. “Only when we have external enforcement, beyond the ACGME, will we see true implementation of duty hours,” she added. The AMSA co-petitioned OSHA based on what Lazreg described as overwhelming evidence that current schedules cause an increase in mood disorders, motor vehicle accidents, pregnancy complications and needle-stick injuries among residents. As the federal body tasked with ensuring employee safety and health, she said OSHA has a responsibility to intervene when evidence so strongly points to worker harm. “OSHA’s denial translates into continued employee risk, injury and death,” Lazreg said. With so much on the line, it’s unlikely that either side will give ground on this contentious issue any time soon. Notably, OSHA said it had received 15 letters in support of OSHA regulating resident hours and 26 letters in opposition. Where do you fit it? Let us know. Is it fall yet? 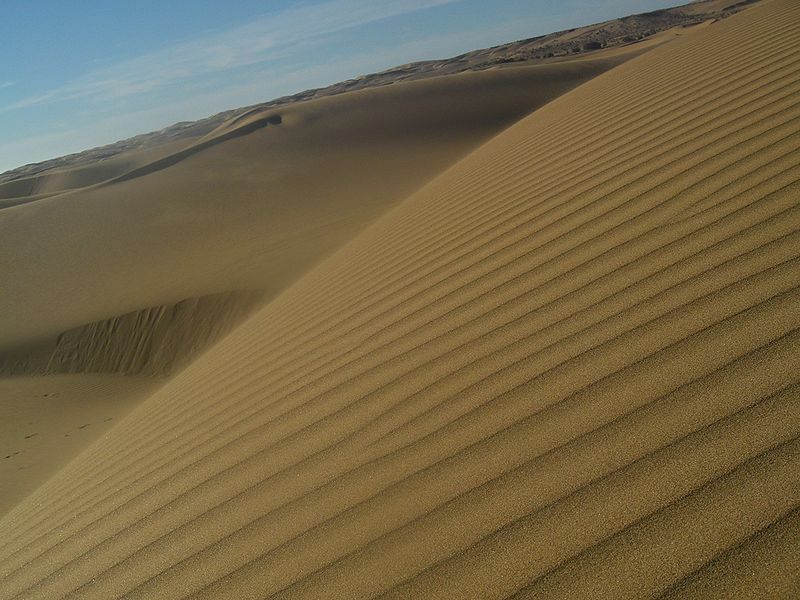 It has been a long, hot summer in much of the U.S. Outdoor exercise is one of the benefits of summer, but this year’s extended, extreme heat prompted the CDC to issue an official advisory, warning the public to exercise caution when exercising outdoors, in order to avoid heat-related illness. Doctors who are doing preseason sports physicals before those August practices begin have a great opportunity to educate young patients (and their parents) and remind them how to help the kids take the heat while they get in shape for the fall sports season. The CDC makes it easy. Refer kids and parents to the CDC Extreme Heat Media Toolkit for reminders about how to manage working out in the hot weather and how to identify signs of trouble. If you were sick, would you rather go to a hospital or a medical center? What do you think most patients would say? Two New Jersey-based consulting firms, Rivkin & Associates LLC and Bauman Research & Consulting LLC, recently set out to answer that question. They conducted a telephone survey of more than 1,000 adults in the continental United States and found that more consumers had favorable views of hospitals than medical centers. 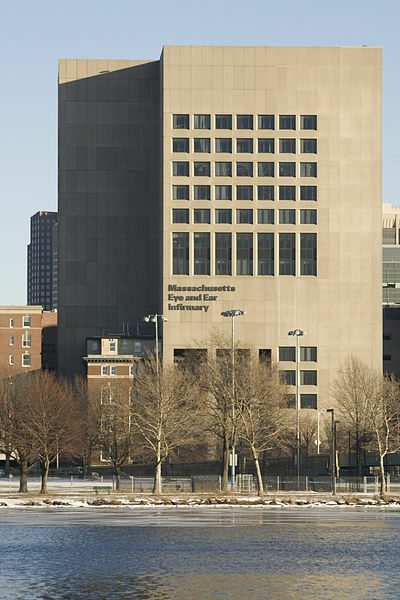 The Massachusetts Eye and Ear Infirmary, a Harvard Medical School teaching hospital, is in Boston. Image via Wikimedia Commons by user Ecm 85. The pollsters asked consumers to think about the terms “hospital” and “medical center” and then say in which type of facility they would expect to have a wider range of services, better quality medical care, up-to-date technologies and procedures, and physicians who are experts in their fields. Hospitals won out in every category. About 61% of survey respondents said hospitals have a wider range of services, while 31% said medical centers do. Another 6% of respondents said it made no difference and 2% didn’t know. Medical centers came closest to hospitals on the question of which facility had more expert physicians. In that case, 46% of respondents said hospitals would be more likely to have top physicians on staff, compared to 34% who said medical centers, 19% who said it made no difference, and 2% who said they didn’t know. The results fly in the face of the conventional wisdom among many hospital leaders that the term “hospital” is old fashioned and that “medical center” conveys more of a sense of prestige, according to Steve Rivkin, the founder of one of the consulting firms that conducted the survey. But since the survey didn’t ask consumers why they chose hospitals over medical centers, it’s unclear why there’s such a gap between the conventional thinking and consumer perceptions. So what about the perceptions of the physicians, nurses, and other health care providers working in those hospitals and medical centers? Take our poll and tell us what you think. Starting today, physicians can begin submitting data to the Medicare program to qualify for thousands of dollars in bonus payments under the federal government’s new electronic health record incentive program. Physicians can attest to their use of EHRs through a new online portal set up by the Centers for Medicare and Medicaid Services. The program, which was created under the Health Information Technology for Economic and Clinical Health (HITECH) Act of 2009 and officially launched in January of this year, gives doctors a chance to earn up to $44,000 over five years through the so-called meaningful use of EHRs. In their first year of participation, they can earn $18,000 for successfully reporting that they have complied with the government’s standards for using EHRs. Physicians have until the end of 2012 to report on 90 days of meaningful use and still get the full first-year incentive. After that, they must report on a full year of data. Since April 18 is the first day that physicians are able to report to CMS, it’s something of an early test of the incentive program. The program has been touted by the administration as a way to finally close the gap in physician adoption of EHRs, but it’s unclear if the incentives will be enough to motivate a large number of doctors to make the switch from paper records. Interest in the program is high, but many doctors still have their doubts. While $44,000 is a lot of money, health information technology experts say it’s unlikely to cover the cost of a new EHR system. Even if it did, the CMS payments come only after physicians have made the up-front investment of purchasing and implementing the EHR systems. And cost isn’t the only factor. There’s also the hassle of switching over to a new system, which may or may not have the functionality necessary to make the office workflow any better. This a concern often voiced by certain subspecialists, who say that most EHRs on the market are geared toward primary care. 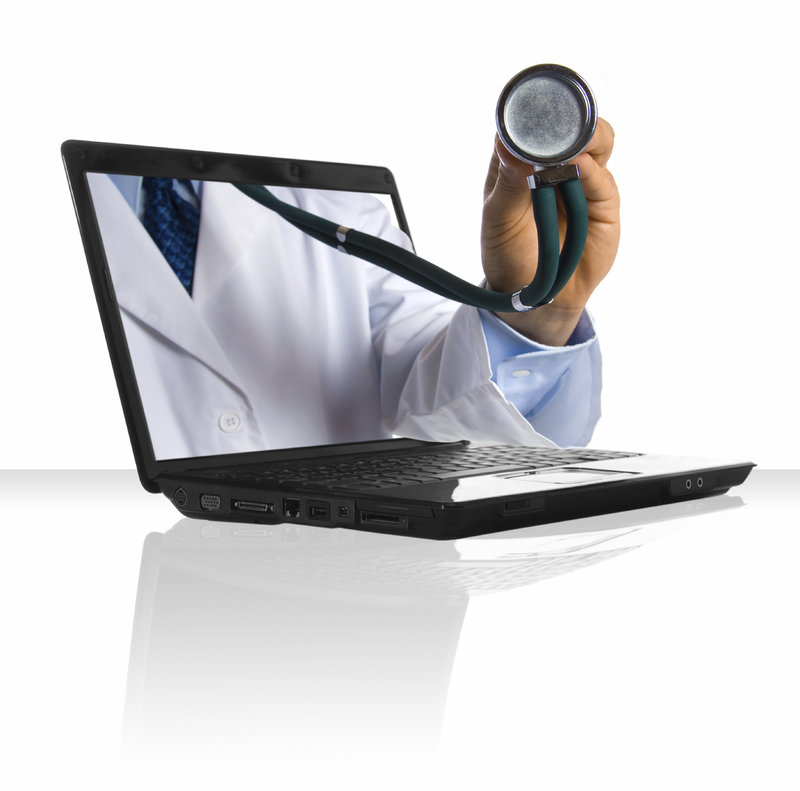 What’s your view on the new EHR incentive program? Take our poll and share your thoughts. Check back with Notes from the Road in the coming months as we follow the progress of the EHR incentive program.